Aquamax Sprinkler Systems Inc. in Dallas, TX was founded in 1998 by Robert Maxvill. Robert is a licensed landscape irrigator with the State of Texas holding license number LI0008514 and is a licensed backflow tester with the State of Texas holding license number BP0004762. We have received many awards for our work including the Consumer Choice Award (2006, 2007 & 2012), Angie’s List Super Service Award (2008-2017), Best Pick Reports (2012-2017), a Five Star rating on Merchant Circle, a Five Star rating with the Home Services Review and an A+ rating with the Better Business Bureau. Aquamax Sprinkler Systems Inc. currently employs 20 professionals, so no job is too big or too small. We run background checks on all of our Dallas Irrigation professionals. 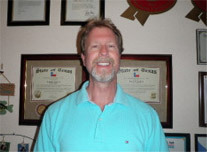 Robert Maxvill was born and raised in Dallas, Texas, and currently resides in Collin County.